I drove the kids to Mc Donalds last week. I have a coupon of buy one take one chicken Mc bites sent in the mail. I want to try the chicken because it has limited time only. I say it was delicious despite being in small pieces. The chicken is so crunchy. The kids have their kiddies’ meals. My son has a cheese burger and the little girl has a chicken nuggets. The apple juice is for my little girl. 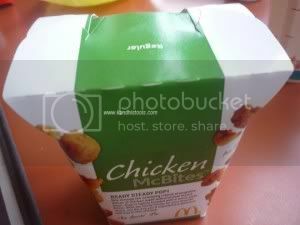 Have you try the chicken Mc Bites yet? If not you should check out your Mc Donald’s. They both have green on them that is why I am linking it to Green Monday. This entry was posted in coupons, foods and tagged apple juice, chicken Mc Bites, drinks, kiddie meals, Mc Donalds. Bookmark the permalink. I love chicken but I prefer the pineapple juice. perfect for green monday entry! ayay, you finally got a taste of the chicken mcbites mamijess…. :) I love it better than kfc’s kay not too salty…barato pa! visiting back mamiJess from my other blog…thanks for dropping by! thanks for ur visit on my greenmonday mommy! 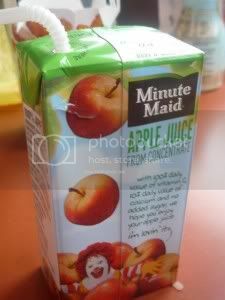 minute made drinks is my favorite drinks, but i cannot take it this one!